A week or so ago I bought myself a Flevobike Versatile Velomobile, having ridden it for five miles. Obviously I had done a little bit of research on these beforehand, which included getting in contact with several owners of Versatiles, so I thought I’d write a bit about what I have learned as there doesn’t seem to be much out there in English. The first thing I want to mention is that in my search for a velomobile I found myself constantly amazed at how helpful people were. I had lots of advice on which velomobile to choose from the German velomobilforum.de, as well as several other people who had owned/ridden different machines. Although with further testing (various people attempting to get in and out of their velomobiles one-handed) I had to discount Mango, Milan, Quest, Strada and WAW as too difficult to get in-or-out one-handed. Sunrider was way too heavy at 50kg. WAW was also outside my price range, etc etc. I did more research and made a shortlist which was headed by the Versatile. The Germans on the forum felt that I should really put the Leitra first but I just couldn’t get over its looks which definitely do not work for me. Plus the Leitra doesn’t have an enclosed chainline and it usually has derailleur gears. However it is 10kg lighter than the Versatile. In the end the Versatile’s selection of features won out in my shortlisting! 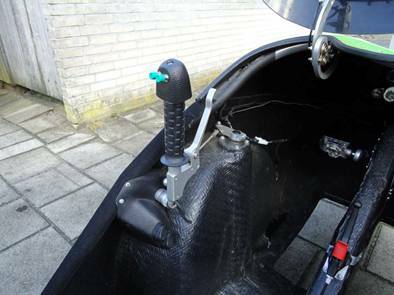 This velomobile was designed by Johan Vrielink and built at Flevobike in the Netherlands. Eventually production shifted to Flévelo in Lübeck, Germany, and the velomobile was given a new name, Orca. The Orca is visually very similar to the Versatile but I think there are quite a lot of small changes to the innards, one of which is that you can now have electric assist. They give technical information on the Orca which is pretty similar to the Versatile. The Versatile was originally released in 2003, priced at 6000€ (pretty steep for a velomobile, the faster/leaner Mango was two-thirds of that price and the much faster Quest a little lower). However the Versatile seems to have been aiming at a different market – not speed but comfort, reliability and sound construction. • The gear is a special modificated Rohloff hub gear that is placed between bracket and rear hub. 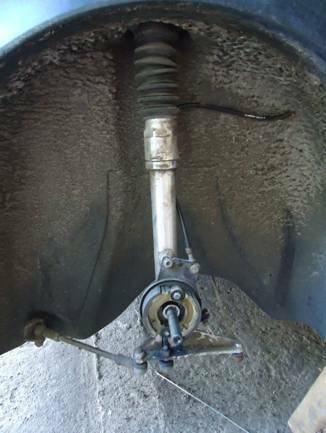 It acts as an intermediate axle and rear fork hinge. In the place of the spokeholes there is another chainring so gear shifting is possible while stationary. 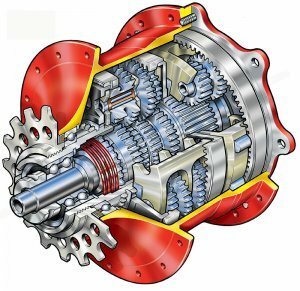 • The drivetrain is completely enclosed, so that no maintenance is needed. • special care has been made to diminish interior noise. All vibrating parts are suspended in rubber. Those who’ve read my blog for a while know that I have an Alfine-11 hub gear in Alfie the Trike (an ICE Sprint). The Alfine-11 is £500 which is expensive for a gear system but I like it. The Rohloff is a whole extra level and costs around £1000 in the UK. The Rohloff hub is a high quality piece of art that offers a trouble-free system, a wide gear range, gearchanging when stationary, high efficiency, light, easy operation, long life and low maintenance. The beauty of the Rohloff is that the gears are all even steps. One gear higher means 13.6% more displacement which gives a range of 526%. These 14 gears compare with 27 derailleur gears (which offer no more than 14 or 15 effective gears because of overlaps and the skewed run of the chain). The Rohloff hub has a high price but pays for itself quickly because it can be used with minimal maintenance or replacement parts, which is not the case for a derailleur system used for many years. 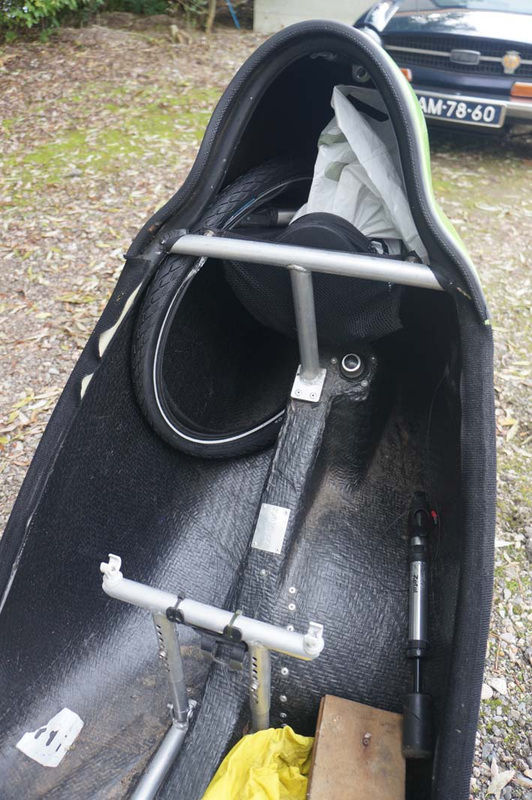 The materials used for the body are thermoplasts, a first for velomobiles. The black lower half is the structural part and is made from Twintex, a continuous glassfibre reinforced polypropylene weave. This weave is vacuum bagged and heated in an oven for a short time, so that the PP weave melts and impregnates the glass fibres. This method allows for cycle times that are much shorter than the traditional hand lay-up method. Mechanical properties of Twintex are similar to a polyester-glassfibre body, except for a much higher impact resistance and higher durability. Moreover, thermoplast are much more environmentally friendly and can be recycled, contrary to thermoharders. The upper, non-structural part of the Versatile is also a thermoplast, a vacuum moulded PET (future ABS) which is painted from the inside. Most of the remaining parts are made from aluminium. Having done lots of research on what I wanted from a velomobile and my riding style/needs, the Versatile topped my list. I read a few of the blogs on them (mostly in Dutch, which I can partially read and which Google Translate helps with anyway) and contacted one blogger, a chap called Peter van der Heul (his blog is at http://versatile072.wordpress.com/). He had owned two Versatiles and done a lot of miles in them (over 62,000km to date) so his advice would be very useful! Peter was incredibly helpful. I sent him a list of questions about Versatiles and he wrote me a lengthy reply and took some photographs and a video. Other people reading this blog to find out about the Versatile might have similar questions so I have included our discussion here. How easy is it to get in and out of the Versatile for someone with a weak arm? The Versatile has a very strong beam in the floor on which you can easily stand. I have made a film of me getting in and out of the Versatile using one arm. The Versatile is heavier than many other velomobiles. In a relatively flat part of the world how much of an issue is this? The Versatile is a bit heavier than other VMs mainly because of the Rohloff Speed hub. However I have never considered this to be a problem. The weight is only one of several reasons why the Versatile is slower than other VMs (the length, open wheel arches, the hood). I consider the Rohloff Speedhub to be one of the best features on the Versatile mainly because you can change gears when the bike is standing still. Of course it takes longer for the Versatile (or any other VM for that matter) to reach a certain speed, but it has never bothered me. I have to stop quite regularly when cycling to work every day to cross roads. As I mentioned earlier I am very pleased with the Rohloff Speedhub. I have never had any problems with the hub. The only thing I do is have the oil changed every 15.000km. Rohloff in Germany claim that the hub can reach 100.000kms without any problems. I believe them. I cycled 40.000km with my old Versatile without any problems. Replacing the inside and outside (front) brake cables (every year). The cables tend to rust a bit on the inside and the parts that adjust the brakes also rust (mainly because of the salt on the roads in the winter). This is very easy to do yourself. Greasing the back chain. I have drilled a small hole in the back of the cover of the rear chain (see the picture). This makes it easy to grease the chain every now and then without removing the cover (if you want to remove the cover you have to disconnect the Rohloff Speedhub). I usually stick a bit of tape on the hole to prevent dirt from getting in. Greasing the front chain. This means removing the cover on the bottom of the Versatile. This is also a very easy job. There is some aluminium metalwork at the bottom. There are 2 aluminium plates which merely serve as protection for the front chain. I have never had any problems with the plates and if I did they would be easy to replace. 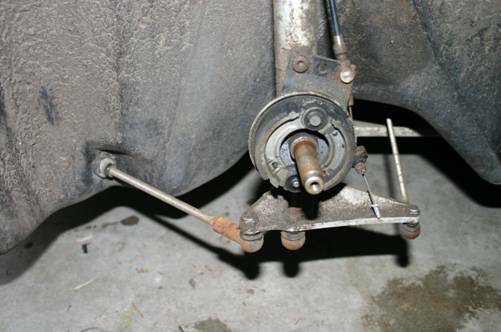 There are also a few rods connected to the steering and they can get a bit rusty because of the salt in the winter. It is not possible for the rods to touch the ground. This has never been a problem with either Versatile. Besides if need be, they can be replaced. I find the bottom of the Versatile to be exceptionally strong and you need not worry about any damage. I sometimes scrape the bottom over the road and this only leaves the Versatile with some scratches on the bottom plates. 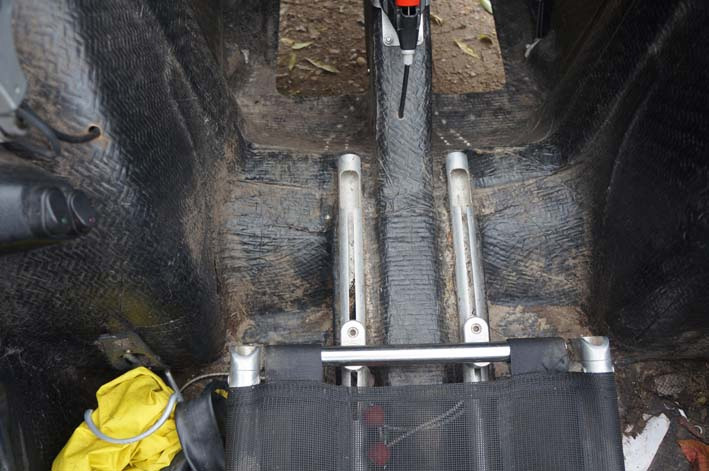 There are two cables at the bottom which lead to the Rohloff hub. I have damaged the outer layer of these cables when scraping the bottom of the Versatile so you have to check them every now and then or protect them with an extra layer (with my old Versatile I used an old bicycle tyre to protect the cables). 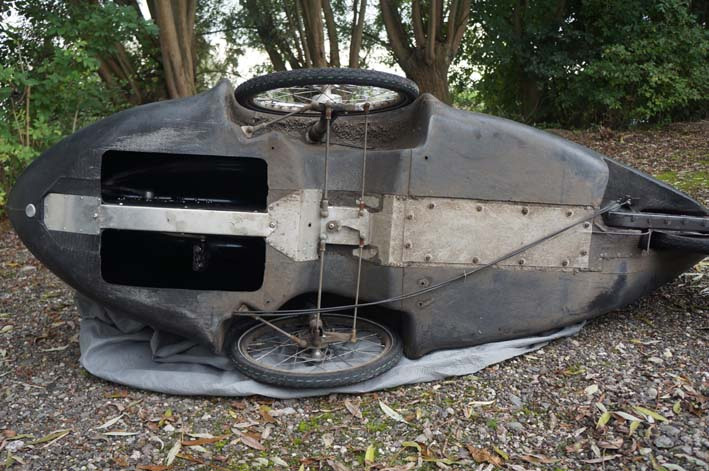 (This photo has the aluminium plates covering the steering mechanism removed – the track rods would not normally be visible). Is it very noisy inside? All VMs make more noise than a normal bike. This takes some getting used to. But it doesn’t interfere with me hearing approaching cars or all other noises around me. The Versatile is very comfortable inside. You have a lot of room around the shoulders and the seat is adjustable. Steering with the joysticks feels natural. Has it got a reasonable luggage capacity? Could I get my small dog in there? There is quite a bit of space at the back. I sometimes have 2 (small) bags with me. You can also place items beside the seat. Can I ride it in all weathers? I always cycle in the winter. I find this to be the most challenging season for the Versatile. The bike is warm inside (I always cycle in a T-shirt with long sleeves), the only problem I have is that my toes tend to get cold when it is very cold outside. 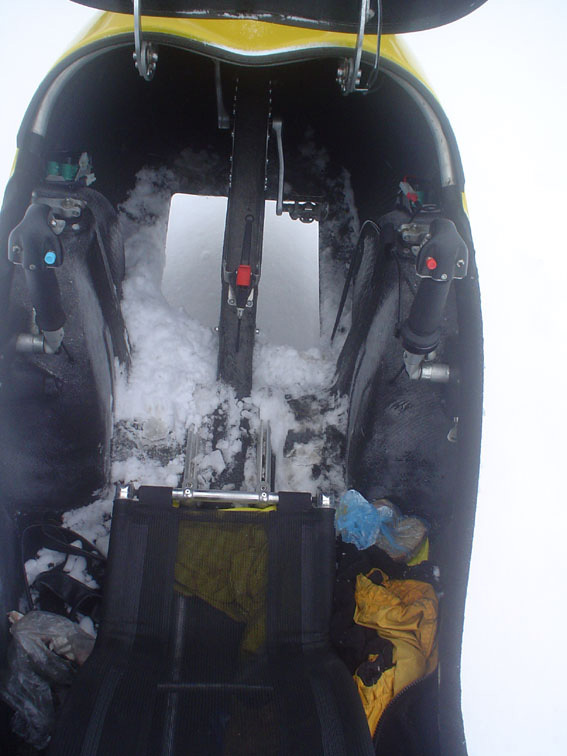 Cycling through snow can be difficult and tiring, that depends on how thick the layer of snow is. If it is very thick you won’t be able to cycle because the Versatile will keep scooping snow through the holes at the front (see the picture below). I have a thicker tyre at the back which help with traction. The snow cannot reach the chains so you won’t have any problems with that. You can stay (relatively) dry in the Versatile. The small black roof that comes with the Versatile will keep the rain from dripping down the side of your head into you neck. Some rain that bounces off the front will reach your face. During long trips in the rain and with heavy showers my t-shirt will get wet around the neck and shoulders eventually. After this extremely helpful document Peter obviously had a bit more of a think as he then sent me a follow-up email. In you last e-mail you mentioned you will probably buy a second hand Versatile. If you do I would like to point out a few differences between the first and second generation Versatile. The first Versatile I had (number 17) had brake handles which were attached to the top of the joystick. There were some problems in the beginning with the brake cables. 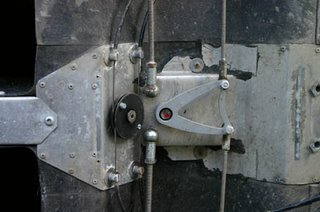 Because of the chafing of the cables in the hinges at the top the cables wore faster and could eventually break. This is not a problem if you check the cables regularly. 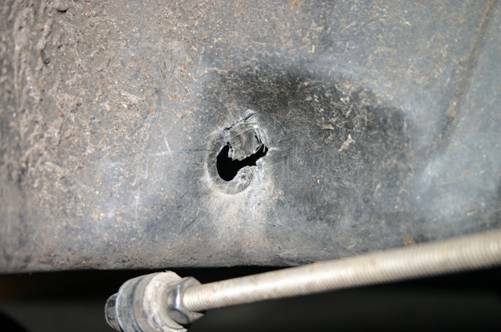 The second thing I would like to point out (this is more important than the first) is the connection of the rod between the centre of the wheel to the wheel arch. In my first Versatile this rod came loose I had to make special plates to fix the rod to the wheel arch. I did manage to fix this http://versatile072.wordpress.com/2011/07/02/gerepareerd/ but I was not sure how long the new plates I made would hold. I never got to find out because not long after that I had the accident. I know that some Versatile owners changed the connection of the rod to the wheel arch but there are still Versatiles out there which haven’t been converted. Here are some pictures of the underside of the Versatile. This is with the protecting plate in place. This is with the plate removed, showing the steering linkage. At this point I’d been in contact with Alex who was selling Versatile 006 and we’d had a bit of a discussion about me possibly buying it. Alex said that he had done less than 1000km in the Versatile in the year that he’d had it. As if Peter hadn’t been helpful enough, he managed to come up with the email address of the previous owner of Versatile 006 (the person who owned it before Alex). It was owned by the wife of Wilfred and she had a blog as well but there wasn’t that much on it. I had a look at http://velomobielfan.blogspot.nl/ but couldn’t find an easy way to contact Wilfred or his wife through the blog but Peter was able to pass on his email address. About the number of kilometres it’s driven, it’s a guess ofcourse. The First owner was a recumbent salesman from Belgium. He used the Versatile just for promotion, not for driving. He claimed to have driven about 500 (five hundred, so no mistakes in the ammount of zeros) kilometres. My Wife? Wild guess: 5000 but it’s rather less than more. After our ownership I don’t know of course. But I don’t think it’s much. So its a rather ‘young’ Versatile even though it’s one of the First. Electrics are not original. I did this upgrade myself. Tail light broke down each time with the original light. My home made version lasted at least the time we owned the Versatile. Front lights were also replaced. Originally there were halogen lights. I replaced them with 3W Luxeon LEDs. This had a few good things: 1) lower power consumption (3W vs 5 or 6W). I made them dimmable. I like to drive with lights on to be seen primairy. Less light is often enough AND saves even more power. Then both lights turn on at the same time (consumes more power but because of the previous mentioned things, in Total the power consumption is still less). This looks nicer. But in the Netherlands a tricycle with 2 front wheels must have 2 front lights burning at night. Because of the setting, you have the option to drive with ‘low’ light but have the option to use them also to signal (push button and they light up brighter), this is the ‘maximum’ ammount of light which can also be turned on at night but then the signal function doesn’t work. Originally the Versatile has 4 amber lights for signalling left/right. They were 5W light bulbs. They didn’t give enough light in the sun (a police man made me stop once because he didn’t see the lights so he said I didn’t show which way I was going). So another upgrade: 3W Luxeons instead of 5W light bulbs. More light, less power consumption. However: I made it 6 lights instead of 4 so the power consumption stayed about the same. Originally the Versatile had a bigger sprocket/chainwheel which I changed to a smaller on my own Versatile021 but I think I also did it with the V006 to make it easier to drive (less power from your legs) at low speed. Alex (the current owner) had said he’d done less than 1000km on this Versatile so overall it’s probably done less than 6,500km (4000 miles). With all this information about V006 I felt pretty confident in what I would find when I finally visited the velomobile. Sure enough, all was as I expected – well-maintained (Alex had had it fully serviced before he bought it a year ago), well kept since in an underground garage, all the electronics worked as Wilfred explained. Within a few minutes of riding the Versatile I had decided to buy it. One problem with a velomobile is their size. I have a large estate car but the boot space isn’t large enough to fit a velomobile in (I can only get my trike in if I remove the seat). Although I was living in England when I bought Penelope I had no plans to return her to England for the two months before I moved to Germany. Alex had already agreed to look after her for me until I move to Germany at the beginning of April. It would be an easy trip by train from Kempen to Rotterdam and then I could cycle back, but it would be a 120 mile trip and it would take a couple of days – and I would have the dog with me in Kempen so couldn’t leave her for that time and she couldn’t come with me on the trip either. Plan B was to hire a van when I am in Kempen to collect Penelope. Vince kindly offered to hire the van in the Netherlands, collect Penelope and deliver her to me (I think he was looking forward to having another go in the Velomobile!) Van hire isn’t cheap but this was a good option. Anyway, Peter kindly offered to collect V006/Penelope from Alex, to give her a check over and do the brake conversion I was planning to do (dual-pull brakes to single-pull), and then when I arrive in Germany to deliver her to me. It was an incredibly generous offer and would save me lots of hassle and expense and would also mean that someone very used to these velomobiles would be able to check it out for me so I was happy to say yes! Many thanks Helen, an interesting article which I thoroughly enjoyed reading. Interesting article – thanks for documenting your experiences! 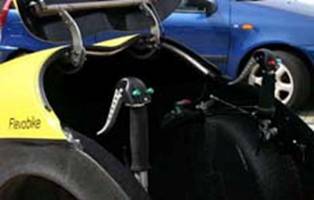 I am surprised you had not come across http://bentrideronline.com and put the experiences there from the large international velomobile crowd to good use. And I’m surprised, based on your needs, that you did not take a closer look at the Leitra as an option for carrying your dog and cargo. Several people in Germany and Denmark transport their children in the back of a Leitra quite easily with an alternative cover that contains windows and I’ve rode around with my 9kg poodle, Max, in the back of a Leitra Sport, and he seems to enjoy it. The rear luggage section has many options and shapes (rounded for larger cargo or children, narrow for aerodynamics, etc.). Carl Georg Rasmussen (the creator/builder of Leitras) is very adept at making custom solutions. And there currently a used Leitra with the child seat still available for sale and test-riding, which would be a simple matter to switch for dog-transport. Regardless, congratulations on your new ride. I hope you enjoy it for many years! Hi Jimm, I did look at bentrideronline and BHPV forum as well. With regard to the Leitra, although it had a lot of good features there were some aspects that I didn’t want, such as the non-enclosed chainline. I was also concerned about the Leitra’s short wheelbase as I’d heard reports about some of them tipping over which is absolutely not what I want. It’s clearly a great option for lots of people but I wanted the hub gear, enclosed chainline, quiet running inside as more important than carrying the dog (who can go on my ICE trike with me, or indeed in a trailer with the Versatile). – The Leitra is without a doubt the easiest to get in and out of. No climbing in/out, or standing on *only* certain parts of the frame is necessary. You lift the nose, step in, sit down. – That can be tricky, but there are Leitras in pretty good condition between 3000-4000. The shop in Denmark usually has two or three available for sale at any given time. – The Versatile wins on this one, but it is quite easy to keep the chain clean with the appropriate use of chain guards, chain tubes, and proper lubricants. I ride all year, in all weather. I typically change my chain every 2-3 years. You’ll find that this is common practice, regardless of the model of velomobile. – And you picked one of the heaver velomobiles in current production. 🙂 (Granted the second generation is lighter than the first generation). 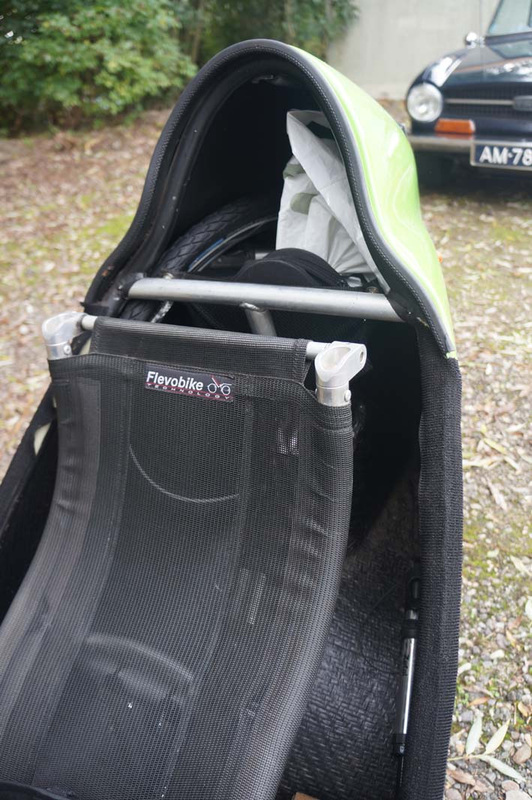 Many other velomobiles can be up to 10-15 kgs lighter. Most Leitras, for example, tip the scales between 25-30 kgs, depending on options. – “Tank steering” has been standard on the Leitra since the mid 1980’s. It’s steering system is designed in such a way that in the event of one side breaking you can still steer both wheels with the other steering lever. This design has been used successfully for people with use of only one hand/arm. – Neither do I (I run an Alfine-9). The nice thing about hubs is that they can fit *any* cycle. Many of the Leitras to come off the assembly line in recent years were fitted with hub drives, including the Rohloff. – Hmm. This one is probably the hardest to defend against, as Leitra are made with quite thin glassfiber so it *can* rattle around on some places. But many Leitra owners report amazing results using foam on the inside of their Leitras. And C.G. regularly uses foam or rubber on all the major contact points. – This comes down to fitness more than any particular brand of velomobile. That said, the Leitra isn’t the most aerodynamic of the bunch, but as a model it has probably logged the most kilometers over all than any other velomobile. And this trend continues with the Leitra Wildcat, which has become popular in eastern France. Most Leitra owners have no problem maintaining a comfortable 25-30 kph during long tours. – This is also a tricky one because Leitras come in all sorts of shapes and sizes, but it still beats out the Versatile here: 195-205 cm versus 243 cm. – As with all human powered vehicles, the maintenance always revolves around cycling needs: keeping air in the tires, oiling the chain, tightening screws/bolts when needed, washing the frame/body from time to time, etc. You have this with *any* vehicle. Now please don’t take me wrong- the Versatile is my second favorite velomobile in term of “ease of getting in and out of”, but I just wanted to set the record straight in terms of features available on Leitras. The most important thing is that you are happy with your purchase and hopefully will enjoy it for years to come. The nice thing about velomobiles is that they tend to have good resale value, so if you find out one model does not work for you, you can always sell it and get another type. Yes the short wheelbase can be a problem, but only if you intend to race around corners. Like all velomobiles, there is a tipping point at high speeds. The Leitra’s shorter wheelbase means that it’s tipping point happens sooner than other models, usually around 15-20kph when taking a corner. The solution is to drive the velomobile like a Formula 1 racecar- fast on the straights, slow in the corners. It’s short wheelbase was really meant for city driving, giving it outstanding turning radius. 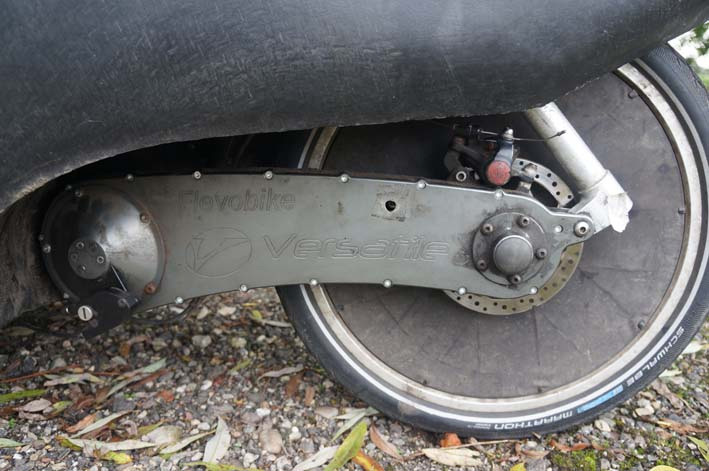 The hub gearing, enclosed chain line, and quiet running are just options to be added to just about *any* velomobile without too much fuss. Very Interesting , and much appreciated .Where did you find out about secondhand enclosed or semi-enclosed trikes ? With the current weather in Berlin and all the rain in England, suggests to me that I should be investigating one. If you mean, where did I find out about velomobiles, it was mainly through meeting a bunch of them in July this year (I got in contact through a cycling forum first of all). It was after I saw them in action that I started thinking of the convenience of having something to protect you from the wind, rain and cold and began to investigate if it was a sensible option for me. Of course I’ve only ridden 5 miles in one so far and I won’t be reunited with Penelope until early April but after that will be able to judge more sensibly how useful it is as a means of transport. It will be interesting to see when I use the ICE Sprint and when I use the Versatile in terms of weather, speed, comfort etc. Just bought an Orca E – awesome fun! Cool! I’d be really interested to hear your impressions of it. Particularly of the lighting in the dark (I have just changed my lights but they are still not as good as I would like). And any other comments too! Orca/Versatile owners are a bit thin on the ground.